Development of a Production Measurement Management System, the strategy included developing a Production Measurement Strategy, providing vision and a mission statement. We undertook metering concept selection, new technology evaluation and Field Trials. De Flow oversaw assurance planning, metering audits and Health Checks. Technical reviews, maintenance compliance and Effectiveness, competency development, competency profile. We also provided Production Measurement Training Courses, Organization and Interfaces. De Flow supported the UK based contractors Bechtel, John Brown engineering and KBR in the concept design of the BTC pipeline and the ACG offshore project in Azerbaijan. This project is the largest BP project worldwide and vital to the supply of Oil and Gas from the Caspian Sea region to the West. 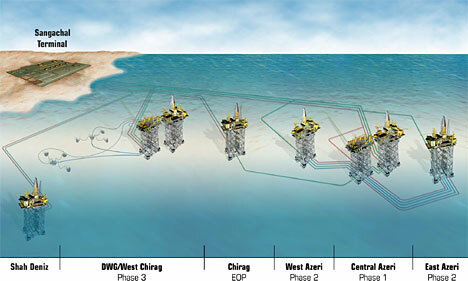 De Flow supported BP and ABB during factory acceptance tests, pre commissioned the flow computer metering systems at the SFS module yard and later on the platforms offshore. De Flow is leading a group of specialist measurement companies, namely, SR Controls and Ken Stothard Associates. Our work on the AIOC ACG project phases 1, 2 and 3 includes measurement concept and detail engineering design, supply of flow computers, factory acceptance tests, commissioning at the Sangachal and STEP terminal plus the ACG offshore platforms. SOCAR STEP Gas Metering Facility. Ali Ghanbari, De Flow/SR Controls engineer commissioning the SOCAR STEP metering facility in 2005, system design by Ken Stothard Associates Ltd.
For Russian operators Sibir Energy and Evikhon (50% Shell) De Flow is working via Global Process Systems Inc. (GPS) in Dubai. De Flow is the "Design Authority" for the entire metering station project with direct responsibility to GPS; this includes Liaison with appropriate local regulating authorities, fabricator and suppliers. The De Flow office in Moscow (AMTek) is organising and undertaking GOST approval for some items of equipment and GOST acceptance at site by Transneft. De Flow total Scope of work on the project is summarised is as follows. General arrangement drawings - metering skid and metering panel. Process and Instrumentation Diagram - P and ID. System Block Schematics and diagrams, electrical and electronic. Basic design calculations - meter prover sizing, meter selection etc. Preparation of the Metering Philosophy document for submission to the end user. Cost estimates for equipment supply, fabrication and manufacture. Functional design specification - FDS. Detail design data for the metering cabinet and flow computer system. Prepare Requisition for the selected fabricator to allow GPS to raise a Purchase Order covering this scope of work. Review fabricator's detail fabrication drawings and Work Procedures for metering & Quality skids. Complete detail design, build and test of metering panel. Prepare and submit Factory acceptance test (FAT) procedures to GPS for review. Find your nearest De Flow office, or leave your contact details and we'll call you back.